As part of their Magic Misfits tour, Magic Giant showed up in Ann Arbor right after playing in Columbus, OH. Naturally, the crowd at the Blind Pig automatically brought an energy and excitement unmatched from the night before in that one state, proving who the better fans are. The Brevet opened the show, setting the stage with a rock vibe centered around lead singer Aric Chase Damm’s soul-and-country vocals to create the Americana sound the band centers around. Though I hadn’t heard of them before that night, I found myself instantly captivated by The Brevet’s unique and powerful sound, my head bopping and feet tapping to unfamiliar tunes that quickly found their way into my music playlist. Their set left me craving for more, and soon that hunger would be satiated. After a quick set change, from the rising fog came a mystifying viola and guitar riff and a steady booming drum beat. Magic Giant emerged, and the crowd responded, jumping and singing along to the songs they know by heart as banjos, harmonicas, and cellos danced around onstage and performed fan favorites that kept the energy infectious and the night young, including “Jade”, “Glass Heart”, and “Celebrate the Reckless”. Halfway through the show, they asked for total silence from the rowdy crowd that continuously screamed their love for this trio. After accomplishing this feat, Austin, Zambricki, and Zang left the stage to perform acoustic versions of “Nothin’ Left” and “The Great Divide” among the fans that heartfully relished in the intimacy that this acoustic proximity provided. 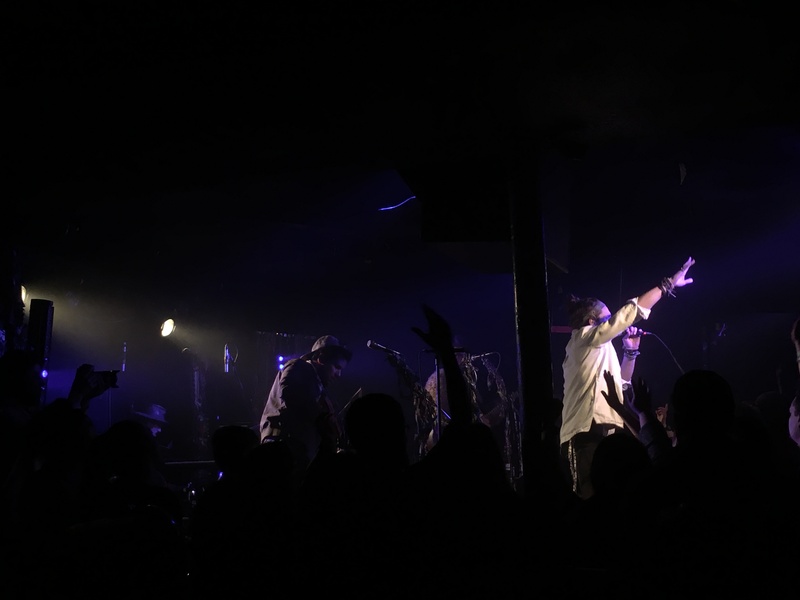 Then, they performed a new single still in the works, introducing a triple clap that will soon to ingrained in Magic Giant fans’ repertoire that currently includes “Woah, hey / Woooaah”s and turning small bodegas into Club Las Vegas. From this little sneak peek, there is much to be excited about for the future of Magic Giant. Until then, I’ll just continue listening to In the Wind and cherish their live charisma from this show as an unforgettable experience. The Brevet and Magic Giant together electrified the crowd with their heart-pounding, soul-jumping music and their excited stage presence that captured their love for performing, transfusing that same love for music into us misfits and sharing their talented gift in a night full of magical happiness free of worries or pain. An escape from the daily struggle of life that weighs you down, their music lifts you up. Good vibes indeed. Orchestral drums, banjo, trumpet, saxophone, harmonica, synthesizers, electric bass, cello, viola, violin, dobro, lap steel, mandolin. These are just a few of the favorite things that Magic Giant likes to play around with. The dynamic musical talent in this indie-folk trio is infinite and ineffable, and their passion carries through every instrument that calls to them. From childhood passion to Acquired Savant Syndrome, Austin Bisnow, Zambricki Li, and Zang have joined forces to embrace nature in their debut album, In the Wind, as they traveled from Los Angeles to Colorado, coastal California, Snoqualmie Pass, and Crested Butte to record their songs outside to capture that true spirit. Now, they bring their magical festivity to Ann Arbor on February 11. 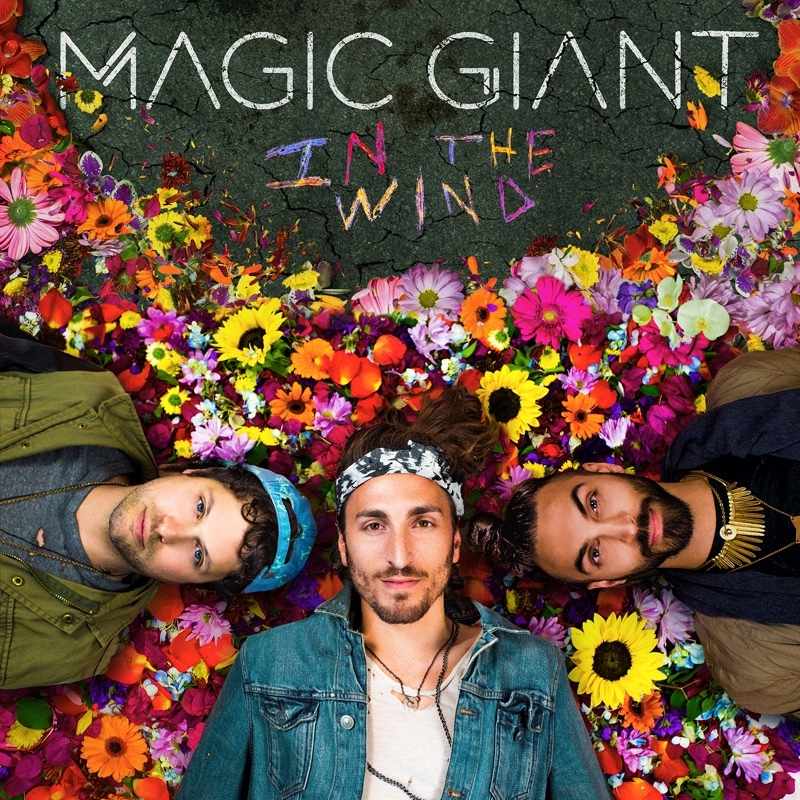 Performing at the Blind Pig, the Magic Giant is sure to captivate the crowd with their refined energy and distinct vibes. Tickets are $15 as they take the stage at 7:30pm Sunday night. -LED ZEPPELIN as performed by Scissor Now! -RAGE AGAINST THE MACHINE as performed by Volcano Worshippers Hour! This event is 18+ so bring all your friends and a valid ID for entry. Amazing wigs, trippy costumes and costumes are absolutely encouraged to get a blast of the past and well, have the most fabulous time jamming to this music. Come say hi to the girl in a Sriracha sauce costume if you spot me there! Tickets are $11 for 18+ and $8 for 21+. Last night I attended the Horse Feathers concert at the Blind Pig, featuring opening band River Whyless. Both bands have a similar folksy, indie sound. River Whyless I was less familiar with. In one of the last songs, one of the violinists took her bow in her mouth so that she could knock on the wood of her violin to the beat. Their songs were upbeat and a nice opener. At one point, someone from the audience shouted, “Killer Jam!” and one of the band members responded with a laugh. “Killer Jam? That has to be a first.” “Maybe ‘gentle jam’ but never ‘killer jam’.” Gentle jam is an accurate description of the type of music Horse Feathers make. Two of the band members kept interchanging between different instruments from acoustic guitar to banjo to instruments I am not knowledgeable enough to name (small banjo perhaps?). One of the parts I was looking forward to most was listening to the fiddle music live. Watching them dance and move around stage with their instruments made for a fun experience. It thought it was really great how thankful the lead vocalist was during the show. All the songs were very familiar to me, so I enjoyed staying for the whole performance. It was a nice way to unwind at the end a day with listless vocals and tender tunes from Horse Feathers. Their music always makes me feel really comfortable with life. the ones that are blamed. It’s like marrow without bone. To live in a house with no home. Where the son is the darkest seed. He crawls with the curs in the weeds. Where had you been son? Not in the street, not in the yard. Only once, I’ll call off the dogs, if you call off your guard. Lyrics credit to Horse Feathers. Craft Spells (above). Photo credit: Daniel Dorsa. The show last Wednesday night at the Blind Pig featured the bands Craft Spells, and had two bands opening for them: The Bilinda Butchers and Gosh Pith. Initially, the venue was pretty empty. The first band was one I had not heard of, and apparently it was not too well known around Ann Arbor either. It turns out the first band, Gosh Pith, is based in Detroit. I found it interesting looking up their bio later that the two member band had formed by happen-chance somehow in Paris, and while the story was interesting, the music itself was not. I found it hard to enjoy the electronic beats and intermittent vocals, which probably would have been better if not for the technical problems they experienced trying to find a balance between the different sounds. The next band to play was The Bilinda Butchers. They come from San Francisco, and got a lot more enthusiasm from the audience when they stepped up. Their songs were familiar and the more upbeat dream pop songs were more popular. Unfortunately, the sound technology was still malfunctioning and though the band attempted to fix the sound problem between songs, they were never able to quite get it. The Bilinda Butchers feature a delicate, more ethereal vocal lead and though it was audible, it was drowned out by the percussion at times. It was nice to see that some of the members of the next band, Craft Spells, were standing at the front of the stage swaying along with the music and cheering them on. Finally Craft Spells came on stage and by this time the main floor was pretty packed. The band set up immediately and started playing some of their more popular songs like “After the Moment” and “Nausea”. Their songs are a lot less poppy than The Bilinda Butchers, but they have a fuller sound with more waves of electronic and synth. It was pretty to listen to and as the final band to play, it was a nice way to enjoy and wind down. Overall, it was one of the more patchy performances I’ve seen at The Blind Pig, but I found that the sounds of the bands complimented each other nicely.